Creative Imaginations makes some 12 x 12 Die Cut Papers that are very elegant. 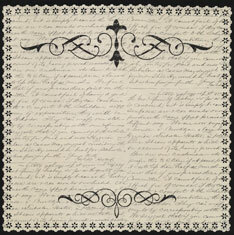 These Scrapbook papers can be purchased individually or in a Collection like this one called Antique Cream. This particular kit came with 2 pages of each of the 4 designs, Floral, Victorian, Scroll and Notebook. Also included in this kit were 2 12 x 12 sticker sheets of card-stock Journaling Boxes in several shapes, Letters, Numbers, Punctuation and various sizes of Embellishments all to match the papers in the collection. This intricate "Floral Design" is also available in Blue and Pink. 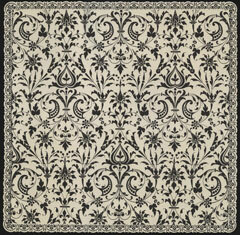 This intricate "Victorian Design" is also available in Blue Berry and Honey Dew. 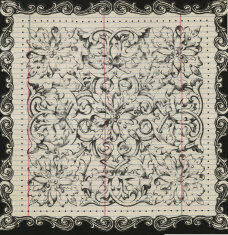 This intricate "Scroll Design" is also available in Teal and Coral. 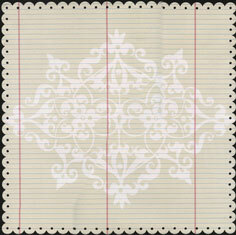 This intricate "Notebook Design" is also available in Teal, Coral and Blue. 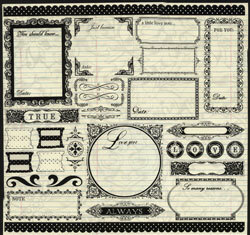 These are the sticker sheets of card-stock Journaling Boxes. As you can see, they are in many different shapes and sizes and there are plenty of them to use with some of your other black and white or cream pages. Some also have some pre-printed text to prompt you on your journaling. These are the Alpha and Number Stickers. What I think is interesting about these is that they are not all the same font. Again, there are plenty of them to use for other pages that might be in the same black and white or cream color mix. Scrapbook Page Tip: These elegant Die Cut Papers would be great for some of those Heritage Layouts where you have only black and white photos. Put that one photo on a black matte or cream matte, stick one of the journaling boxes on a matte as well and you have a gorgeous page with very little work. Scrapbook Page Tip: Or, since these papers are all die cut with either intricate edges or holes in patterns around the paper, put a solid colored sheet behind to emphasize the die cuts. And, speaking of Die Cut Papers, check out our page on other Die Cut Embellishments. 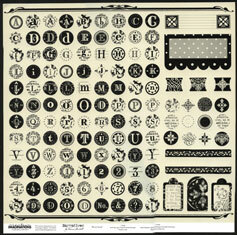 Check out some Embellishments - Scrapbooking Die Cuts that are also available.